WELCOME TO DAY 2 OF MY 12 DAYS OF CHRISTMAS DECORATING, CRAFT AND GIFT IDEA Challenge. I scored these lovely used and somewhat rusty canning jar lids at a local thrift store for 5 cents a piece. I picked up the picture frame for free at the “Use It or Lose It” event (same place I picked up the vinyl records – re yesterday’s post). My passion is to reuse or repurpose things in anyway I can. A ton of my inspiration comes from fellow bloggers (who have fabulous ideas) and of course Pinterest. When I first posted about the wonderful junk I got at the “Use It or Lose It” event, it was suggested I use the lids as art on the wall. With Christmas being the next big season, I decided to make my lids into Christmas tree wall art. I removed the glass (saved it for another project) used green construction paper to cover the existing picture and used hot glue to attach my lids to the paper. I embellished with some jingle bells to look like mini ornaments. I struggled with what to use for the trunk of my tree and the inspiration came to me when I was making some cork ornaments (stay tuned they will be in another post ). 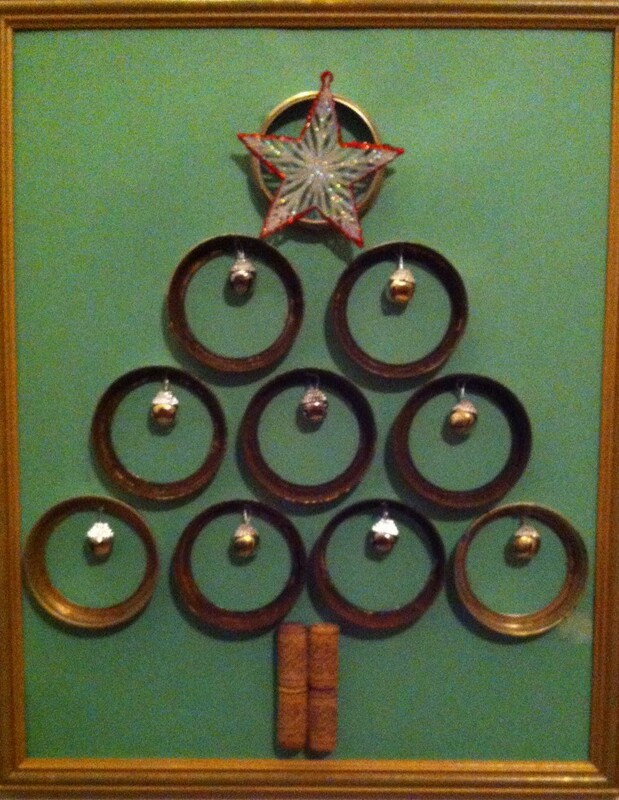 I glued four corks on for the trunk of the tree and a star ornament(which I found in my stash) for the tree topper. If you haven’t noticed yet, I like things that exude simplicity and I’m ok with imperfection, as a matter of fact that’s usually what I like most about the things I create, they are not perfect but unique – sort of like me!!! And ya know what…I think that is A Wandaful Thing!!!! This entry was posted in Decorate, DIY and tagged canning, Challenges, Christmas, Crafts, crafts, Decorate, DIY, easy, frame, jar, lid, picture, repurpose, reuse, tree. Bookmark the permalink.